Dizziness is a very common problem, especially in older people. 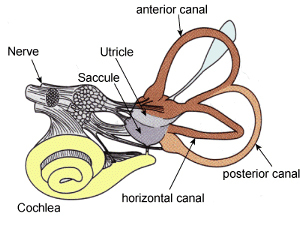 It is basically a disturbance of the function of vestibular mechanism. On this picture you can see the organ responsible for balance and hearing, contained within the temporal bone of the scull, right behind the outer ear. The vestibular mechanism is located in the labyrinth, comprised of three canals: horizontal, posterior and superior. The canals have special hair-like receptors on their inner lining, and are filled with liquid. When we move our head or otherwise change the body’s position in space, the movement of the liquid inside the canals affects the receptors, which in turn send the signals to our brain, informing it of the change in position. If the receptors are irritated by something, our perception of the change of our body’s position in space can be exaggerated, which is perceived as dizziness or vertigo. Among the causes of chronic vertigo, presence of calcium deposits in the fluid surrounding the hair-like receptors is the most common. These deposits are like sand or tiny rocks. They move with the fluid and irritate the receptors. This condition is called benign positional vertigo. It becomes more common with age. Like labyrinthitis, it is not dangerous, but highly unpleasant. Meclizine helps in this situation too, but “tincture of time”, so effective in labyrinthitis, does not work here. Epley maneuver is a simple and often effective method of treating this condition. 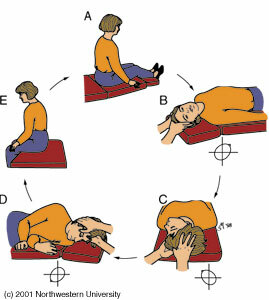 While the patient is lying on her back, the doctor slowly and gently turns her head in specific directions, holding it in certain positions for brief periods of time. It takes about a half an hour. The goal is to move the larger “rocks” in the canals to positions, where they are less likely to irritate the sensitive hairs. This procedure is fairly effective, but may need to be done more than once. Physical therapy is also often recommended to treat this condition. Special exercises are used to train the vestibular mechanism to be less sensitive. Physical therapy is helpful in making the effect of Epley maneuver more long-lasting. Trauma is often followed by dizziness as well. This is a common consequence of head injuries, like severe shaking in an auto accident. The sensitive hairs in the labyrinth are quite jarred by the shaking and become irritated. Physical therapy works in some of these cases as well, while Eppley maneuver is not as often indicated. “Software” treatment modalities, in particular homeopathy can be a god-sent in any of the chronic situations. I have a number of cases of fairly severe chronic dizziness, which were either completely cured or made much better with homeopathy. My acupuncture colleagues have similar stories. What will help a particular patient? One never knows till they try different methodologies. If you are lucky, the first thing you try will help. It may also be the second or third. One thing is sure: it is never a good idea to just continue taking meclizine and doing nothing else. Remember, it cures nothing, just makes life more livable while you are on it.